The nasal septum is the piece of tissue separating your nostrils into two compartments. When thiscartilaginous membrane develops a hole, you have what is medically called a nasal septum perforation. This medical condition may be caused by trauma, such as nasal piercing or nose picking, but it may also be caused by long-term use of nasal sprays, chronic nose bleeding (epistaxis) or as a complication of nose surgeries like rhinoplasty orseptoplasty. What is a Nasal Septum Perforation? The right and left nostrils (nasal passages) are separated by the nasal septum, a thin bone and cartilage with a delicate lining or mucosa. This septum provides central support for your nose and ensures that air flows through your nose gently, without turbulence. As a result, air passes through your nose and is filtered and humidified. This type of smooth airflow is important for healthy breathing. Small perforations have a diameter of ≤ 0.5 cm. Medium perforations have a diameter of 0.5-2.0 cm. Large perforations have a diameter of > 2 cm. Symptoms of nasal septum perforation depend on the size and location of the perforation. The severity of symptoms can range from nosebleeds and foul smelling crust to collapse of the nose, which all presents trouble to your breathing. How Does Nasal Septum Perforation Affect My Breathing? Aside from making the face look good, your nose also makes breathing more comfortable. Airflow through your nose is humidified and warmed by structures in the nose called the nasal turbinates. These turbinates are natural humidifiers, but when you have a cold, they may get swollen and congested. You may breathe through the mouth, but you will soon get a sore throat because of drying of the tissues. 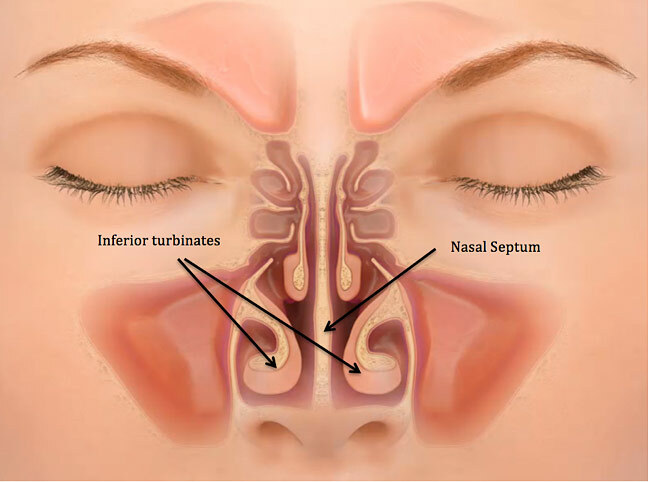 With a nasal septum perforation, the normal smooth airflow through the nostrils is disrupted, causing recirculation or swirling of inspired air within the nose. This results in the inspired air stealing more heat and moisture on its way back out of your nose through the perforation, leading to excessive dryness of the nasal mucosa. Septal perforation can make your nose crusty, bloody, and even infected with bacteria. This can easily penetrate the mucosa and cartilage, causing foul smelling crusts and pus in the nose, as well as nosebleeds. If left untreated, the infected nasal septum perforation may slowly become larger, destabilizing the nose, and cause it to collapse. Most cases of nasal septal perforation are iatrogenic in nature, meaning it’s caused by a medical procedure, such as a complication of septal surgeries. How is Nasal Septum Perforation Diagnosed? The diagnosis can be established during physical examination of the nose. Nasal endoscopy or anterior rhinoscopy (using a nasal speculum) usually reveals crusting and/or bleeding adjacent to the edge of the perforated area. Anterior perforations (located in the front portion of your nose) are usually more symptomatic than posterior perforations (located at the back of the nose). The size of the perforation differs, and could involve nasal cartilage or bone. Treatment depends on the size and location of the septal perforation. Small perforations near the front of the nostrils, whichcause whistling, are often easily treated with different techniques compared to larger perforations, which are more likely to form crusts and to create nasal congestion. Posterior perforations cause fewer symptoms and may be treated conservatively. Symptoms of nasal septum perforation may be relieved with saline nasal irrigation or air humidification to lessen crusting. You can also apply antibiotic ointment or petroleum-based ointments inside the nose to relieve pain and dryness at the affected site. Lubrication and nasal hygiene may provide relief to your symptoms, but progressive enlargement of the perforation may occur if you only apply these remedies. These nasal buttons are used for insertion into the perforation. Although some patients can tolerate the buttons for several years, other patients don’t. Fortunately, you can also choose customized buttons from some providers. Closure of the nasal perforation with skin grafts and flaps may be done surgically. Larger perforations may be treated using various surgical techniques such as autografting (using tissue inside the nose or from another part of the body) to close the hole. Tissue flaps may also be created to cover the nasal septum perforation. Why Does Your Ear Hurt When You Swallow? Why Do I Have Fluid Draining from Ear?